Kettle Brand certainly keep it simple. And so shall we. Color coded bags. Colors associated with the flavor. Minimalist design. Plain but fairly ideal for marketing purposes. 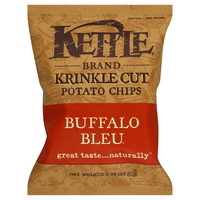 The background 'Krinkle' Cut Chip images seem to counteract the plain bag by making it a little fussy. The big bold flavor area of the bag does however work really well. A Wavy, Ridged Chip, or Krinkle Cut as Kettle spell it, will need additional thickness to maintain its rigidity. The Kettle Cooking process will also provide a firmer Chip. This will then provide a snappy, wholesome crunch that regular Chips could only envy. With skin visible on most Chips edges and the wide thick Ridges dominating, these looked and felt natural. The golden yellow and sometimes brown tinged Chips had few blemishes or broken bag constituents. A good coating of speckly seasoning, and very little grease remained on fingers after a scoop from the bag. These were somewhat more peppery than the barbecue flavoring upon which it was presumably based. Kettle Brand probably had the grammar police chasing after them when they released this flavor - not content with misspelling 'Crinkle' they added French to the bag! The Bleu of course refers to the cheese. A good blue cheese will often pair up well with grapes and a glass of Bordeaux, but in this case it was a creamy cheesy type of affair, with a little cheesy pounce rather than a giant blue cheese leap. A little bland.